Redefining The Zone. Texas Tech 88, Texas A&M 83. Mike Singletary set a new career-high tonight in Texas Tech’s first round Big 12 Tournament game against Texas A&M… in the last ten minutes of the game. That’s right, Singletary caught lightning in his shooting hand, as he exploded for 29 straight points (9-10 FG; 8-10 FT) in the last quarter of the game (previous career high: 25) as he brought his team back from a 21-pt second half deficit. His performance was the second-longest such conflagration of consecutive points, ranking only behind (you know this one, right?) Bill Mlkvy from Temple fifty-eight years ago, who threw up an ungodly 54 in a row in a game against Wilkes. Courtesy of ESPN FC, we got to see the second half of this one, and we’re glad we did. Singletary didn’t look particularly quick or athletic or smooth – he just hit nearly everything he threw up at the rim. Oh, and did we mention that he didn’t even start the game tonight – maybe Pat Knight should just play him in the final ten minutes of the game from now on. Texas A&M, on the other hand, may have just watched its NCAA dreams die with their second-half gag (Mark Turgeon, double-team the guy torching your defense!!!) tonight. Probably not, though – the Aggies’ RPI is still strong, and they did finish hot down the stretch. Providence 83, Depaul 74. PC allowed the Blue Demons to hang around in this one, and by virtue of playing the 0-18 team, they probably didn’t help their RPI or SOS any… but a win is a win, and with the win comes the opportunity to play #1 seed Louisville in the Big East quarters tomorrow. The good news for the Friars is that Louisville is lifetime 1-3 in this tournament, but the bad news is that the only team that has beaten them all three times has been Pittsburgh. Baylor 65, Nebraska 49. NU probably didn’t have much of a case for an NCAA bid, but this loss solidifies their exclusion. The more important question is whether Baylor can salvage their extremely disappointing season by going on a run to win the Big 12 title. They will play #1 seed Kansas tomorrow, and although highly unlikely, KU is still a rather young team and could be vulnerable. Oklahoma St. 81, Iowa St. 67. OSU will get a chance to renew bedlam with Oklahoma tomorrow based on their handling of ISU tonight. The Pokes were already in solid RPI position, but this win ensures their bid. Now it’s a question of seeding, and with two hard-fought Ls to Oklahoma already, will the third time be the charm? West Virginia 74, Notre Dame 62. ND meekly slithered into the night (NIT) with their loss to WVU today. The Irish really needed a strong run into the late rounds of the Big East Tournament, and instead they couldn’t out-physical a team that thrives on that style of play today. Alex Ruoff had 25 pts and Devin Ebanks had 7/18 in the winning effort; the Mountaineers will get Pittsburgh tomorrow in what is sure to be a slugfest. #13 – Robert Morris (24-10, 15-3 NEC). 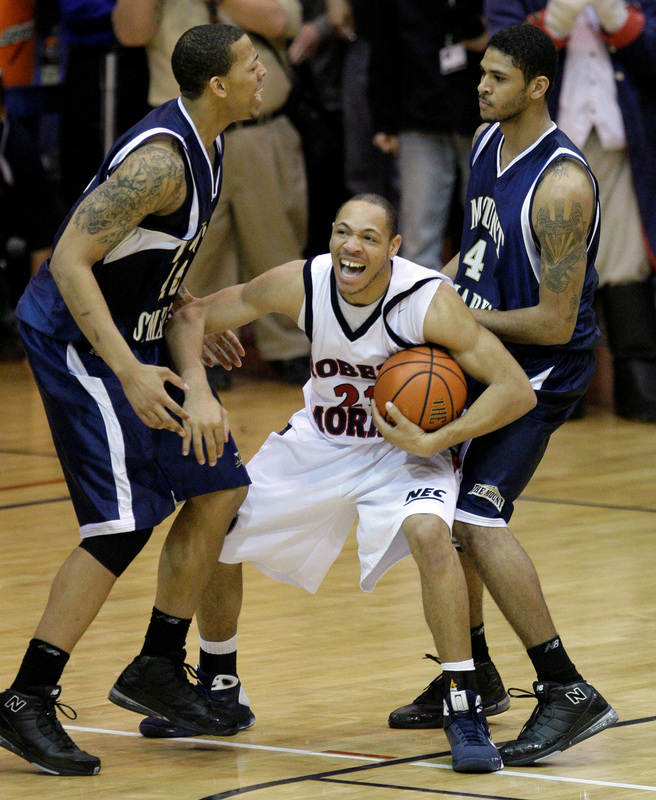 Dallas Green instantly became a NEC legend tonight as his shot from the baseline after scooping a loose ball off the floor was the game-winner that sent RMU to it’s sixth NCAA Tournament, but its first since 1992. It was his only basket of the game, and even his coach said “oh no” when the ball scooted to his direction. Much-maligned Mezie Nwigwe scored three points in eighteen minutes of play. Something to Remember: Although it didn’t show tonight (4-14), the Colonials are a strong three-point shooting team, averaging 39.1% throughout the season. They hit nine against Miami (FL) in an 8-pt road loss. #14 – Portland St. (23-9, 11-5 Big Sky). PSU nearly let their second consecutive Big Sky title get away from them tonight, as they allowed upstart Montana St. to come back from ten pts down late to tie the game. But it was Julius Thomas’ dunk with 3.5 seconds remaining that gave the Vikings the lead back and a strong defensive effort on the ensuing MSU possession ensured that Jeremiah Dominguez and company will make a return appearance in the Big Dance. STR: Beware. This team is an experienced squad that lost by one point at Pac-10 champion Washington and beat Gonzaga by seven. #1 Kansas ripped them last season, but they should have a higher seed this time around, and if they can catch a somewhat limited offensive opponent, they have a chance to pull the upset. A10. St. Louis, St. Joseph’s, Duquesne and Richmond all advanced to the quarterfinals tomorrow. RTC Live is there with College Chalktalk live-blogging all of the action. The best game of the day Thursday will likely be the streaking Richmond Spiders (6 of 7) taking on Dayton. Big 12. The only other game not covered so far was Texas’ win against Colorado. There are some juicy matchups in Oklahoma City tomorrow, but we’re most looking forward to the third incarnation of Bedlam – OU vs. OSU in a true neutral venue. OSU just might do this one. Big East. Marquette had an easy time with St. John’s and Syracuse got into a bunchastuff with Seton Hall before finally pulling away late. We’re going to say it right here, right now. Tomorrow’s quarterfinal round is the greatest collection of teams in a conference tournament’s quarterfinals round EVER. There are four teams with realistic F4 chances and seven teams with legitimate S16 possibilities. Providence is the only weak link, and they managed to beat a #1 team this season. All of the games are worth watching (damn you, Dauster), but we’re most excited about the Marquette-Villanova game at 2:30 EDT so we can see how to parse these two teams. Big West. Two minor upsets with UC Davis and UC Riverside today, but this league is completely wide open. Don’t be surprised if an eight-seed wins this thing. CUSA. Over in the Retread Conference, Rice (Ben Braun), S. Miss (Larry Eustachy), Tulane and Houston (Tom Penders) all advanced today. The best game tomorrow is the Houston-UTEP matchup. MEAC. No upsets in this league tonight, as all the higher seeds but one (who will play tomorrow) advanced to the semifinals. Mountain West. In the opening round game, Air Force knocked off Colorado St. Tomorrow keep an eye on UNLV-San Diego St., a game with potential bubble implications depending on how deep the winner of this one goes. Pac-10. Stanford and Wazzu advanced to the quarterfinals tonight. Several good games in the quarters tomorrow, but we’re most interested to see how UCLA responds after its loss a couple of weeks ago to Wazzu, who they’ll play again tomorrow night. SWAC. The top two seeds in the SWAC advanced tonight. Two other quarterfinal games continue tomorrow. ACC. The first round matchup of Miami (FL) and Virginia Tech holds the most interest, as both teams have been slumping down the stretch, but have enough talent to turn things around in short order. Big 10. The first round begins tomorrow, and clearly the best game here is the Northwestern-Minnesota game. Neither team will get in from winning this one, but they will assuredly be out if they lose it. MAC. The MAC continues with its quarters after a day off as well. No idea which game to keep an eye on here. None whatsoever. SEC. None of the first round games are very good, but if you must pick one, go with Kentucky’s attempt to win 4-in-4 to keep the NCAA streak alive, starting with Ole Miss. Southland. The quarterfinals begin, and Stephen F. Austin is the favorite. WAC. The WAC is picking back up after a day off in its quarterfinal round. Remember that RTC Live will be there for the Utah St. vs. Fresno St. game, which should be the most interesting game of this round. This entry was posted on Thursday, March 12th, 2009 at 2:15 am by rtmsf	and is filed under after the buzzer. Tagged: acc, after the buzzer, alex ruoff, atb, atlantic 10, baylor, big 10, big 12, big east, big sky, conference usa, dallas green, depaul, devin ebanks, iowa st, mac, meac, mezie nwigwe, mike singletary, mountain west, nebraska, nec, notre dame, oklahoma st, pac-10, portland st, providence, robert morris, sec, southland, swac, texas a&m, texas tech, wac, west virginia. You can follow any responses to this entry through the RSS 2.0 feed. You can leave a response, or trackback from your own site.